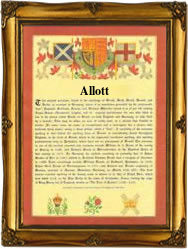 This interesting surname derives from the Middle English and Old French female given name "Allot, Aalot", pet forms of "Alis", itself a contraction of the Germanic personal name "Adalhaid(is)", composed of the elements "adal", noble, and "haid", kind, sort. The name has an honourable history, being used initially as a royal title for German princesses in the same manner as "Augusta" was bestowed on the wives and daughters of Roman emperors. It was also the name borne by the wife of the emperor Otto the Great. "Adalhaidis" passed through the stages "Adelice" or "Adelica", and by about the 12th Century had been shortened to "Alicia", whence "Alice, Alis", and its hypocorisms "Allot(t)" and "Aalot". "Alote" (without surname) was entered in the 1191 Records of Bury St. Edmunds, Suffolk, and an Adam filius (son of) Alot was noted in the Pipe Rolls of Lincolnshire, dated 1203. The surname first appears on record in the latter part of the 13th Century (see below), and is unusual as a European surname in being derived from the name of the first bearer's mother. This is because European society has almost invariably been patriarchal throughout history, and as a result the given name of the male head of the household has been handed on as a distinguishing name to successive generations. On October 13th 1565, John Allott and Ann Mellis were married at All Hallows, Bread Street, London. The first recorded spelling of the family name is shown to be that of Peter Allot, which was dated 1272, in the "Hundred Rolls of Cambridgeshire", during the reign of King Edward 1, known as "The Hammer of the Scots", 1272 - 1307. Surnames became necessary when governments introduced personal taxation. In England this was known as Poll Tax. Throughout the centuries, surnames in every country have continued to "develop" often leading to astonishing variants of the original spelling.